A 1920 advertisement for 'Brookholt', the O.H.P. Belmont estate designed by Hunt & Hunt c. 1897 in Hempstead. 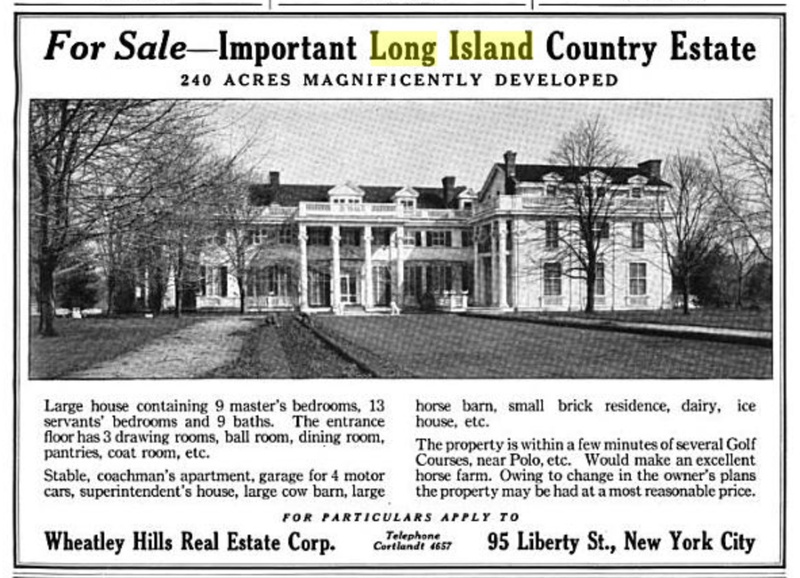 Belmont died in 1908 and his widow Alva built 'Beacon Towers' in Sands Point in 1917. Click HERE for more on 'Brookholt'. Advertisement from Country Life, 1920. "Owing to change in the owner's plans the property may be had at a most reasonable price" Indeed !!! Could the "owner" still have been Alva Belmont in 1920 ? And, who highlighted "Long Island" ? First picture I've seen that has an added third story over the awkward wing. If it was done for aesthetic improvement, it didn't work. 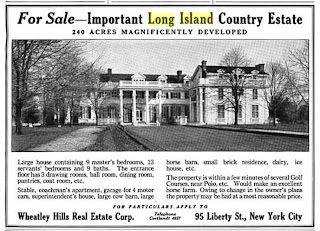 Old Grey Dog -- the highlighted "Long Island" just indicates those were at least part of the search words that located this ad. According to Wikipedia: http://en.wikipedia.org/wiki/Alva_Belmont Alva Belmont sold 'Brookholt' in 1915, died in Jan 1933, & 'Brookholt' burnt in 1934. Zach says it was demolished in the 1950s. Either way it's gone & I agree with Glen -- lipstick on a pig. I would love to see the floorplans of this astonishingly awkward house. Do you know if they have been published with the Hunt & Hunt archives? It's hard to believe that Brookhlolt was conceived and built in one go. If you didn't know better, you would think it resulted form an attempt to tart up and expand a far more modest house on a particularly uncompromising bit of property. Always been fascinated with the blocks on top of the columns,until I came across Hadrians bed, a structure on the banks of the Nile with the same column treatment. There is also a copy in Greenwood Cemetary.